It’s safe to say that graduating senior Preston Stockmaik is showing no symptoms of senioritis. He just won the Findlay Chevrolet-sponsored 12th annual Drive for Excellence. Findlay Findlay Chevrolet General Manager Doug Fleming, left, congratulates Cimarron-Memorial High School senior Preston Stockmaik for winning the Drive for Excellence at Wet 'n' Wild. 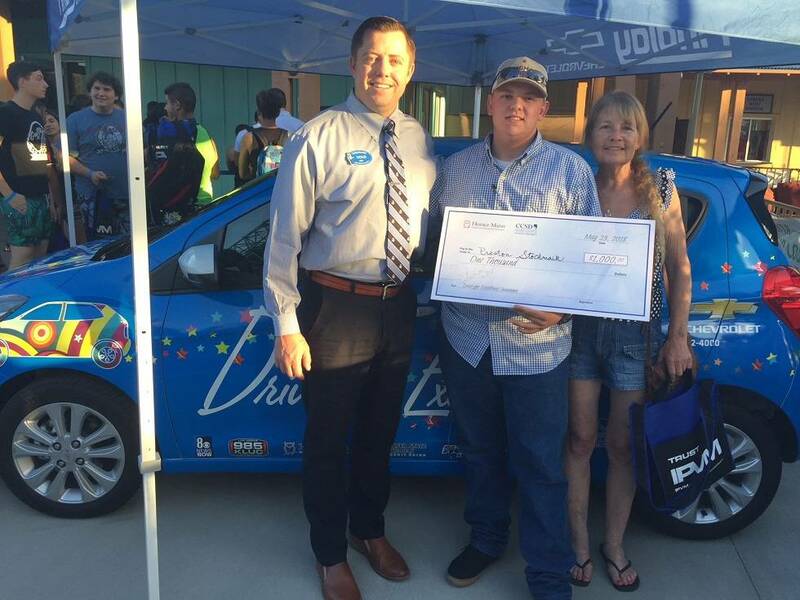 A straight-A student, Stockmaik won a new Chevrolet Spark from the dealership. On the right is Preston’s mother, Shannon Stockmaik. With a report card highlighted by his straight A’s for four years in a row — thus maintaining a 4.0 grade-point average all four years — the 18-year-old Stockmaik was the recipient of a new Chevrolet Spark courtesy of Findlay Chevrolet. Stockmaik also will receive a $1,000 insurance credit from Horace Mann Insurance Company. The award ceremony was hosted by Wet ‘n’ Wild in the southwest valley. A graduate of Cimarron-Memorial High School, Stockmaik said his next move would be to Texas, where he will study to become a horse trainer at Craig Cameron’s Ride Smart Horsemanship apprenticeship program in Bluff Dale. Eligible students had to maintain a weighted grade-point average of 3.7 or higher, along with an attendance record of zero unexcused or unverified absences. Findlay Chevrolet General Manager Doug Fleming praised the promotion. Other sponsors of the event included Silver State Schools Credit Union, Wet ‘n’ Wild, 8 News Now, Advertising and Marketing Solutions, Horace Mann Insurance Co. and 98.5 KLUC Radio. Situated at 6800 South Torrey Pines Drive just south of the 215 Beltway, Findlay Chevrolet is part of Findlay Automotive Group founded by the late Pete Findlay in 1961. The umbrella now includes 32 dealerships in Nevada, Utah, Oregon, Idaho and Arizona. The 33rd dealership, Mazda, is currently under construction in the Valley Automall.